What’s up in Highland Park ??!! Today we’re in Highland Park MI. The 2.97 sq. mile city about 6 miles from downtown Detroit was once a thriving manufacturing city. Henry Ford purchased 160 acres to build the Highland Park Ford Plant which opened in 1909, in 1913 when he started the first assembly line, population swelled dramatically from 4,120 people in 1910 to 46,500 by 1920. In the mid 1920’s Chrysler Corporation was founded in Highland Park, they purchased the Maxwell plant covering 150 acres, the site served as their headquarters for the next 70 years. Population declined when the Davison Freeway opened in 1944, cutting through the center of the city, the trend continued after the 12th Street Riot in 1967, Ford closed operations at the Model T plant in 1973. Chrysler moved its headquarters to Auburn Hills in 1993. The city was left without thousands of jobs and lots of vacant buildings. Nature took over when industry left, open fields and towering Maples are home to birds, pheasants and other wildlife; it’s quiet, peaceful. 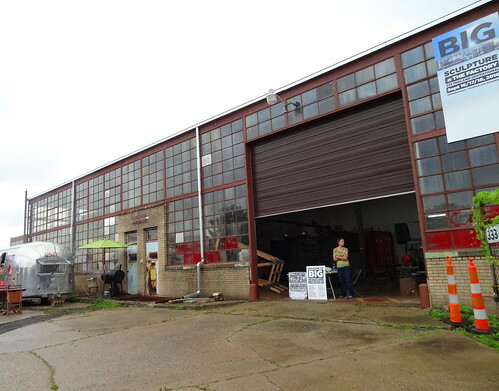 We’re on Midland Street, in the old Lewis Metal Stamping Plant, artists Robert Onnes and Robert Sestock purchased the huge building, turned it into artist studios and named it The Factory. 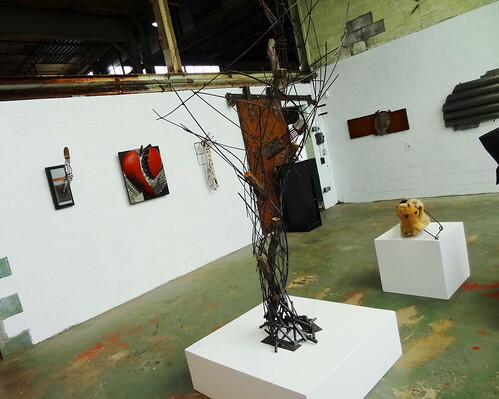 We’re here at The Factory at 333 Midland for BIG SCULPTURE, an invitational show made up of Michigan artists, music, food and drink; over 200 sculptures and installations are on display indoors and out. After we park on the street we approach the front of the building, brick and stone it is Art Deco in style, I like the details around the entryway, the curved end of the building. 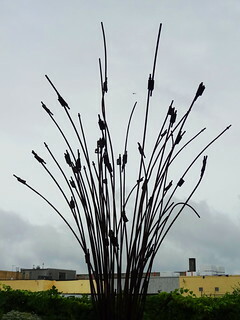 We enter the yard, towering sculptures dot the landscape in all directions, it’s raining so we head indoors to the 23,000 sq. ft. building. 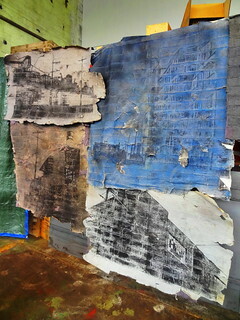 Factories are unique structures; block walls, enormous walls of windows allow the space to be drowned in sunlight, old signs remain from when this was an active plant. 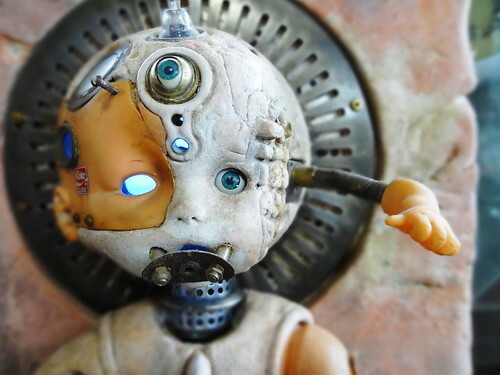 I stand still, looking around I can imagine huge machines stamping out parts, noise so loud workers point and nod to communicate; the hustle and sweat that goes into making things. 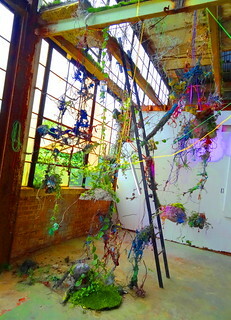 Now days the space is home to 17 artist studios, the tradition of making things here continues. 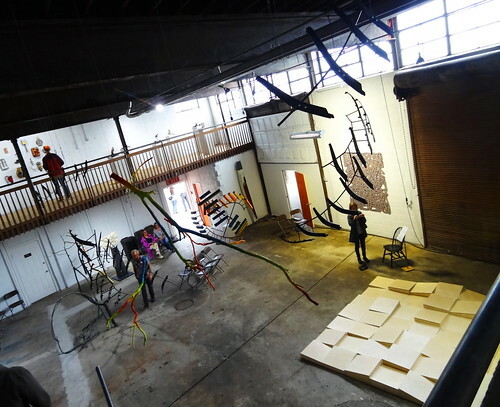 We are greeted by Tim Pewes “Mega Bat” suspended from the ceiling, the space a maze of temporary walls creating mini galleries. 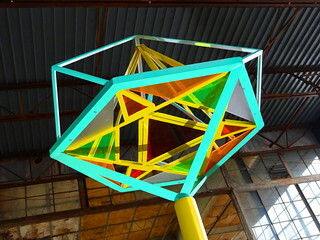 We meander from exhibit to exhibit; Peter Daniel Bernal’s “pinata’s” are suspended from the ceiling making a powerful statement. 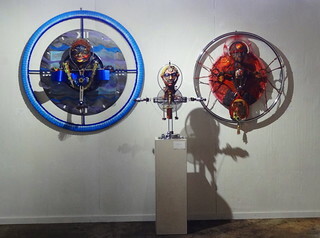 Steve Mealy’s beautiful masks are encircled by a bicycle rim and tire. 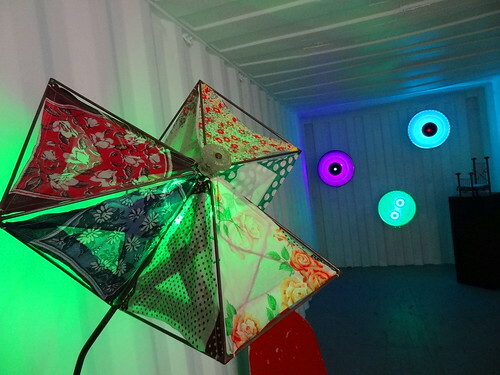 We enter the ModernContainerGallery, funky pieces light up the back wall. 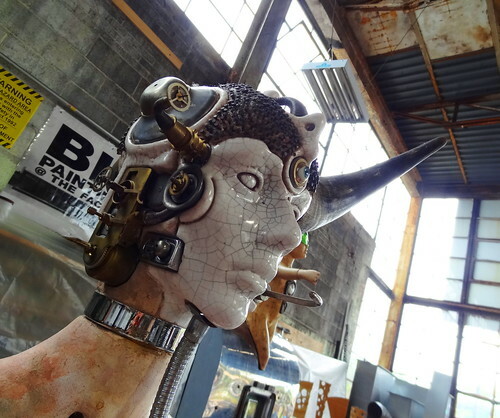 Everywhere we look there’s something wonderful to see, 3-dimensional art hangs on walls, rests on pedestals, sculptures stand tall. Down a hall we find more galleries, frames hold interesting scenes, life-like sculptures of heads wear leaves and acorns by Pamela Day, a wall of sconces by Alvaro Jurado includes antique metal trucks lit by bare bulbs and black rubber tires, the next gallery feels like the outdoors; ivy, sod, moss and greenery dangle, hang, weep from strings and beams reflecting the scene on the other side of the window–it’s quite lovely. 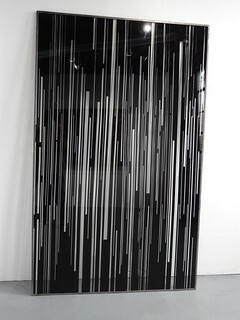 The rain has let up, we step outside, Richard Bennet’s sculpture rises up to the sky, it reminds me of planets in the solar system, whimsical pieces in stripes bend and curve, I recognize a sculpture by Olayami Dable, the scraps of mirror first grab my attention, his work is unmistakable. I love the tall metal letters that spell out DETROIT, the thick wishbone-like piece, the giant reeds and cattails in the distance. The annex building adds another 12,000 sq. 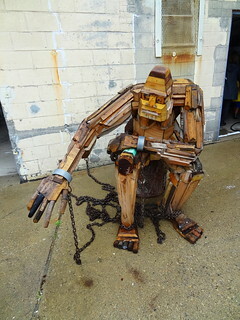 ft. of space; a forlorn-looking man made of wood is chained to a stool near the entrance. Inside a modern wood and metal staircase leads to a balcony in the otherwise wide open space, a child slides on a wooden sculpture laying on the floor. Upstairs we get a better look at the hanging mobile-like pieces, we can take in the whole room from here. 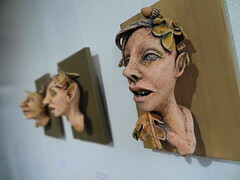 Orange cut-outs balance on a white cube, cool clay pieces cling to the wall, Susan Aaron Taylor makes things from felt she creates herself, her animals are lifelike. We’re taking another walk through the main building as not to miss anything. 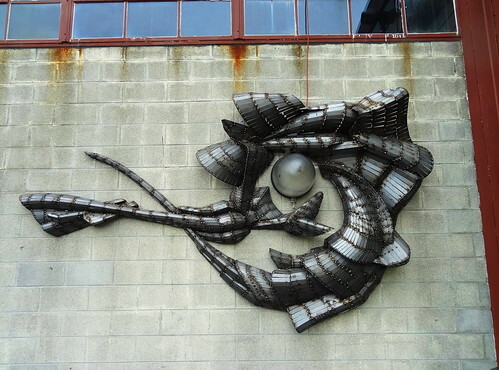 Just outside the entrance I see a metal sculpture mounted on a bare wall, made of tiny metal pieces welded together it swirls, surrounding an outdoor light. 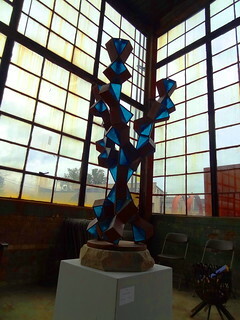 Kris points out a glass piece by Albert White, the sun is coming out, lighting up the deep blue glass. 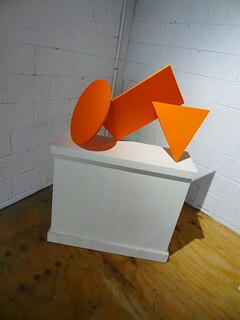 We continue our walk past characters, shapes and forms hanging on the wall or posing on blocks or squares; a giant fishing pole protrudes from the wall titled Hook, Line and Sinker. 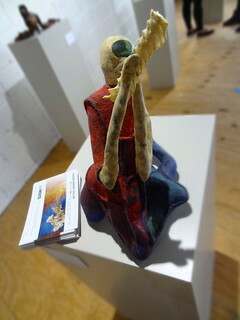 Some of the art is humorous, some of it serious like Sandra Osip’s Hell In A Hand Basket, some of it like Catherine Peet’s Sea Monster is silly and fun. 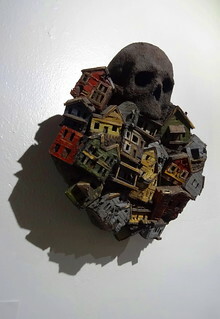 Kris is fascinated by the detail in some of the works; circuit boards, tiny monitors, mechanical pieces all used together to create attention-grabbing works. 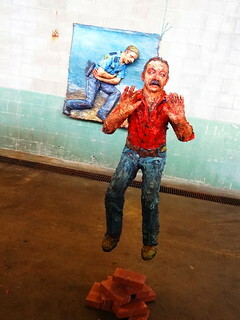 The exhibit continues until October 22, the Factory is open on Saturday and Sunday from 10 am-4 pm. 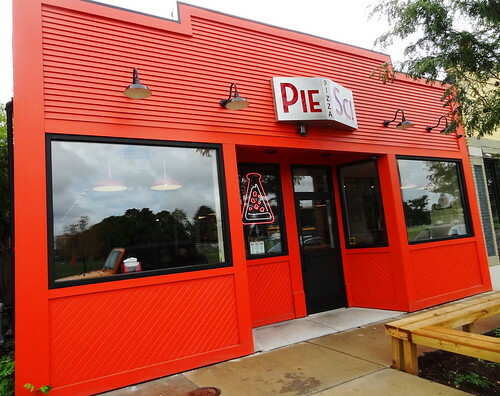 We’re having lunch in Woodbridge, Pie-Sci has been open about 2 months now after doing weekend stints serving gourmet pizza at Woodbridge Pub. The Trumbull storefront is decked out in bright red trimmed in black, the color theme continues inside. 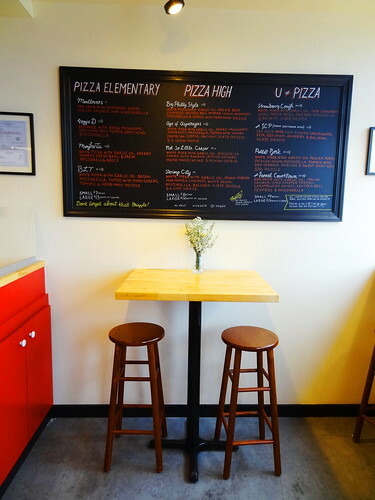 The menu hangs on a wall, the pizza of the day is described on a small chalkboard near the counter. 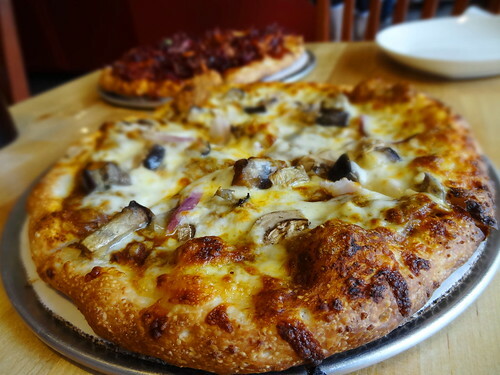 Pizza is divided into 3 catagories; white pizza comes with garlic oil, traditional red sauce comes on varieties like Meatlovers and Veggie D. We scan the menu of a dozen combinations, order at the counter then have a seat in the dining area. The soda machine is filled with Detroit City Soda, I sip on diet cola while we wait. Patrons come and go picking up and ordering pizza, it smells delicious in here! At last our pizza is done, we are having the Pulled Pork: white pizza, pulled pork, pickled onion, mozzarella topped with red cabbage coleslaw and Sweet Baby Ray’s bbq drizzle, yum! We also ordered the special of the day, Curry Train: green Zaatar curry, eggplant, mushroom, red onion, mozzarella, also excellent. Our last stop is Will Leather Goods on Second Ave. The attractive store has a cozy little coffee shop tucked inside that serves great coffee, tea and pastries. It’s one of those cool hidden gems you can always count on for good service and good products. 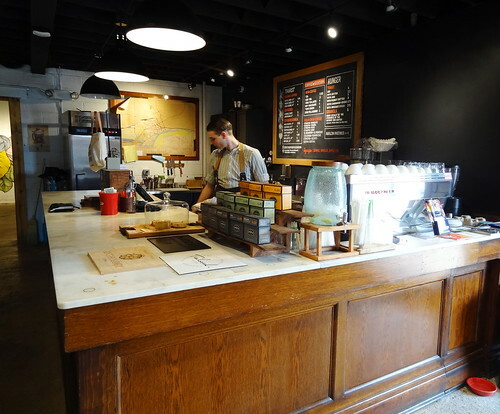 The designated coffee shop area is decorated with items from an old Detroit Fire Station; gives it nice character. Kris is having a cold brew while I’m in the mood for a hot cup of java, mine comes with a tasty chocolate square. 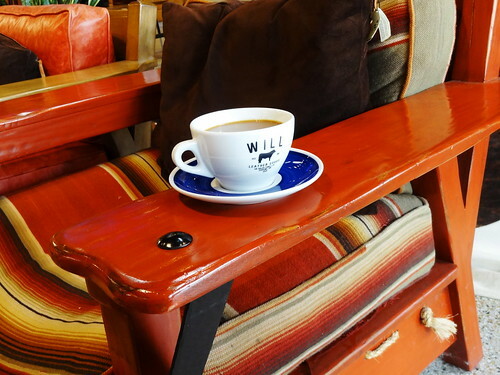 We move out into the main showroom, relax in one of Will’s comfy chairs and drink up our coffee in one of the most delightful places in the city to just chill.